Boom, Lukas can officially drop the mic on childhood! 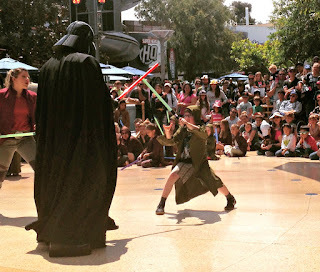 That's because on our recent trip to Disneyland, which happened over Spring Break here in Seattle, Lukas was able to don a Jedi robe, draw a green light saber, and battle against perhaps the most iconic villan in movie history, Darth Vader! Hey, but I am still his father!! As you can see from the photo above, Lukas had amazing form as he parried all light saber srtikes by Lord Vader, and returned his own forceful blows as well. This was no surprise to Mrs. LIAYF and I as he has been training around the LIAYF household for years now. Certainly this was one of the highlights of our vaction, as Lukas and I arrived early at Disneyland, waited in line until the gates opened, then raced full speed over to Tommorowland where we were met by.....a rope. Yep, that's right. Once he and I had raced through the park to the Tommorowland, where the Jedi Training was to take place, we had to wait another 20 minutes behind a rope as hundreds, or perhaps thousands, of park goers squeezed up behind us waiting for the rope to drop. And all around us, we heard dads and moms, and sons and daughters talk about one thing. One Thing! Getting signed up for Jedi Training, which only happens for a few lucky Padawans each and every day at Disneyland. So, as we prepared for the rope to drop I implored Lukas to hold onto my hand while we ran through Tommorowland to the sign up line so that he wouldn't get run over by the hoards of crazed dads and Mom's gathering behind us. I was carrying a heavy backpack, but I was determined to also save my son from determined mass. Then the rope dropped, the signal was given, and Lukas surprised everyone and sprinted like a cross between The Flash and Dash from The Incredibles and left me in the dust becoming the first person to reach the place where the training was to take place. This from a kid who was in a wheelchair with a broken femur just a few months ago! The only problem was that this was NOT the place to sign up for the training, which we didn't know. This allowed another Dad to pass us in line. This was no problem though, as second in line was plenty enough to choose our time slot and get Lukas signed up to train as a Jedi. And, to ultimately battle every Jedi's arch nemesis, Darth Vader! Honestly, I'm not sure who loved this more, Luke or his Father. And by his Father, I am not referring to the guy in the black mask! Our first trip to Disneyland was amazing, and I will post more about it in the near future, but this one experience had to be the defining moment of our trip. The Force is Strong in our son. He fought like a true Jedi, and certainly made this Father proud.